Although there are better known examples, Lyman Lamb typified a certain type of 1920s ballplayer: the batsman who piled up gaudy stats in the high minors but whose major-league career was brief and undistinguished. In one torrid three-year span playing for the Tulsa Oilers of the Class A Western League, he averaged .358, with an extraordinary 314 extra-base hits. Benefiting from playing home games at Tulsa’s bandbox McNulty Park, Lamb registered 100 doubles in 1924, still (as of 2014) the all-time one-season high in Organized Baseball. He also equaled the [then] record of hitting safely in 11 consecutive at-bats. Nor was Lamb a one-dimensional player. He was swift afoot, had a strong, accurate throwing arm, and was an excellent defensive outfielder who could also handle infield posts adequately. Despite these attributes, Lamb failed to impress during his late-1920 through 1921 stay with the St. Louis Browns. He also flopped during a late-season 1925 audition in the near-major league caliber Pacific Coast League. In the end, Lyman Lamb appears to have had not quite good enough talent for success in baseball’s highest echelons. Lyman Raymond Lamb was born in Lincoln, Nebraska, on March 17, 1895, the third of four boys born to Louis Lamb (1871-1925) and his wife, the former Lillian Smith (1870-1953).1 Lyman was raised on the family farm in Union, about 40 miles east of Lincoln, and attended school there through the eighth grade. By 1910 the Lambs had relocated to Lincoln, where Lyman played baseball on local sandlots. He first attracted press notice playing amateur ball for the Lincoln All-Stars in 1914.2 The following year, Lamb entered the professional ranks, signing with the Fairbury Shaners of the Class D Nebraska State League. He batted a respectable .289 in 38 games before the league disbanded in mid-July.3 Thereafter, Lamb joined the Wichita Wolves of the Western League, but the jump to Class A ball proved too much for the novice 20-year-old pro. After batting a woeful .083 (4-for-48), Lamb drew his release.4 He then finished the 1915 season in the Class D Central Association, batting .244 in 40 games for the Keokuk (Iowa) Indians. 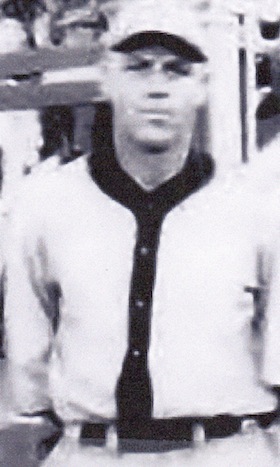 After some wrangling, Lamb was admitted back into local amateur ranks, playing in early 1916 Lincoln City League games for a club called the Ducklings, and then for the Lincoln Cleaning & Die Works team.5 By June he was a member of yet another city league club, the Saratogas.6 But Lamb wanted to try his luck as a professional again. After negotiations to join the Paris Survivors of the Class D Western Association foundered,7 Lyman signed with a league rival, the Tulsa Producers, with whom he received his first extended taste of pro ball. In 136 games mostly at third base, the righty-throwing/lefty-batting Lamb hit .281, with nine home runs among his 35 extra-base hits. Promoted to the Joplin Miners of the Western League, Lamb cemented his pro status with a solid year at both the plate and in the field. In 147 games for the fourth-place (79-68) Miners, he batted .262, with 47 extra-base hits. He also showed defensive versatility, playing a majority of the time at second base but also filling in at third and in the outfield. Of more long-term importance, Lyman had found a home, as he would live in Joplin for the remainder of his life. The following season, Lamb returned to the Miners and played shortstop, batting .244 until the demands of World War I brought the Western League season to a halt on July 7, 1918.8 Lyman joined the war effort on September 6, when he was inducted into the US Army. With the conflict in Europe drawing to a close, he remained stateside until mustered out as a corporal on February 18, 1919.9 A month later, Lyman took on different type responsibilities, marrying Joplin native Faith Bradleyford. In time, they would have two children, Rosalie (born 1920) and Monte (Lyman Lamont, born 1928). Lamb was back in a Joplin uniform once again in 1919, spending the majority of his time at shortstop and batting .271, with 40 extra-base hits, for a noncontending (57-78) Miners nine. A fourth season in Joplin proved a charm. Switched to the outfield, he turned in another solid year, batting .282, with 46 extra-base hits, and finally attracted some major-league interest. In late August his contract was purchased by the St. Louis Browns.10 After a two-week wait, Lamb made his major-league debut on September 14, 1920, playing left field and going 1-for-3 against left-hander Harry Harper in a 7-4 victory over Boston. The next day he went 2-for-4, with a double and three RBIs. By season’s close, Lyman had batted .375 (9-for-24) in nine games, and seen action at all three outfield positions for the fourth-place (76-77) Browns. Lamb had made a good first impression and was retained by St. Louis for the 1921 season. A syndicated preview of Browns’ “Rookies and Unknowns” provided the following thumbnail description: “Lyman Lamb. Chunky outfielder. Hits ball hard. From Joplin.”11 But with St. Louis returning the outfield of Ken Williams, Jack Tobin, and Baby Doll Jacobson, all lifetime .300-plus batters, there was little room in the outfield for Lamb, while his short 5-foot-7 stature and the presence of future Hall of Famer George Sisler eliminated any chance of his playing first base. Rather, manager Lee Fohl announced that Lamb and Dud Lee would alternate at third.12 Lyman had some good games in the early going, knocking in three runs in an 8-7 loss to Cleveland on April 22, and notching his first three-hit game ten days later against Detroit. His first and only major-league home run came off Philadelphia Athletics right-hander Dave Keefe on June 11. But as the season continued on, he saw less and less playing time, being supplanted at third base by Frank Ellerbee. For the most part, Lyman then backed up Marty McManus at second base and played the occasional game in the outfield. On September 24, 1921, Lamb played second and went 0-for-3 in a 2-1 loss to Boston. It would prove to be his final major-league game. A week later, the 81-73 Browns finished a respectable but distant third to the 98-55 New York Yankees. In 1922 the St. Louis Browns made a concerted, season-long run at the pennant-winning Yankees, finishing one game behind in the final American League standings. But Lyman Lamb played no part in the effort. In January the Browns sold Lamb and pitcher Joe DeBerry to the Louisville Colonels of the Double-A American Association.13 Although he was only 26 years old, Lamb would not get a second shot in the big leagues. In 54 games for the Browns, Lyman had batted .272 (43-for-158), with 22 runs scored and 21 RBIs. He struck out 19 times, walked only four times, and stole two bases. His work in the infield had been competent (.944 FA), and he had played errorless ball in 13 games as an outfielder. Given his youth, versatility, and the impressive numbers that he was about to put up in the minor leagues, there seems no obvious reason why Lamb never returned to the majors. But the fact remains that his major-league career was behind him. For reasons unknown to the writer, Lamb never played for Louisville. Instead, he spent the 1922 season in the outfield of the Tulsa Oilers of the Western League.14 Here, Lamb’s offensive numbers erupted – doubtless inflated by playing home games at McNulty Park, a hitter-friendly enclosure whose dimensions (LF: 310/CF: 320/RF: 274) were more suitable for softball.15 The 1922 Tulsa lineup would feature no fewer than six regulars who would hit .337 or better, including Lamb. Oddly, Lyman got off to a slow start, his average hovering in the .225 range in the early going. Thereafter, Lamb’s bat exploded. At season’s end, his batting average stood at .361, with a .655 slugging percentage. Lyman’s 109 extra-base hits included a career-high 32 homers and a Western League-leading 68 doubles for the pennant-winning (103-64) Oilers. Lamb encored in 1923, batting .341 and again leading the WL in doubles (71), as (101-67) Tulsa finished a close second to the Oklahoma City Indians (102-64). Lamb’s batting average revived somewhat in 1926. He hit .305, with 35 doubles, 16 home runs, and 55 RBIs in 147 games for the seventh-place (72-84) Spudders.26 The following season, Wichita Falls was wire-to-wire Texas League champion, with outfielder Lyman Lamb appearing in all but one of the Spudders’ 156 contests and batting .318 with 47 doubles for the pennant winners. Wichita Falls then made its championship season complete, sweeping the Southern Association titlist New Orleans Pelicans in the postseason Dixie Series. Limited to 120 games in 1928, Lamb was again solid, batting .300 with 39 doubles for a second-place Wichita Falls club. Months later, Lamb was sold for $2,500 to a downtrodden Texas League opponent, the last-place Beaumont Exporters.27 The ever-admiring Sporting News approved the Beaumont acquisition, informing readers that “Lamb is a colorful ballplayer and comes to Beaumont with a classy record. … He is an easy .300 hitter.”28 Lyman did not disappoint, batting .315 in what would prove to be his final season as an everyday player. But the 72-86 Exporters needed far more than Lamb to rise above seventh place in Texas League standings, and released the veteran after the season. 1 Sources for the biographical data provided herein include the Lyman Lamb file at the Giamatti Research Center, National Baseball Hall of Fame and Museum, Cooperstown, New York; family info accessed via Ancestry.com, and certain of the newspaper articles cited below, including the obituary published in The Sporting News, October 19, 1955. Lyman’s brothers were George (born 1891), Ralph (1892), and Roy (1899). Lyman Lamb and the writer are not related. 2 See e.g., the Lincoln (Nebraska) Daily Star, June 14, 1914. 3 Unless otherwise indicated, statistics have been taken from Baseball-Reference. 4 As noted in the Denver Post, August 4, 1915. 5 As reported in the Lincoln Daily Star, May 7 and 16, 1916. 6 As per the Lincoln Daily Star, June 16, 1916. 7 According to the Lincoln Daily Star, June 26, 1916. 8 Baseball reference works list Lamb as 5-feet-7, 150 pounds, but interestingly, his World War I draft-card application lists his height as 5-feet-4. 9 As per the military grave marker application submitted by his widow in December 1955. 10 Denver Post, August 30, 1920. 11 See e.g., the Kalamazoo (Michigan) Gazette, March 16, 1921, and the (Cheyenne) Wyoming State Tribune, March 28, 1921. 12 As per the (Boise) Idaho Statesman, April 12, 1921. 13 As reported in the Washington Evening Star and Springfield (Massachusetts) Republican, January 15, 1922, Tampa Bay Tribune, January 18, 1922, and elsewhere. 14 Press reports indicated that Lamb had come to terms with Louisville and would report to spring camp on March 13. See, e.g., the Canton (Ohio) Repository, March 1, 1922, and the Cleveland Plain Dealer, March 2, 1922. But no report of Lamb actually playing for Louisville was found by the writer. According to Baseball-Reference, Lamb played one early-season game for the Kansas City Blues of the American Association. Thereafter, it was announced that his contract had been purchased from the St. Louis Browns (and not Kansas City) by the Tulsa Oilers. See the Tulsa World, April 22, 1922. The purchase price was later put at $2,500, per the Tulsa World, July 30, 1922. 15 Erected in 1919, McNulty Park was already notorious for having served as an outdoor holding pen for black citizens detained during the Tulsa race riot of 1921. After the city’s refusal to permit expansion of the grounds, McNulty Park was razed in 1930. 16 The major-league record for doubles in a single season is 67, set by Earl Webb of the Boston Red Sox in 1931. 17 Surprisingly, Lamb’s .373 BA was only third-best on the 1924 Tulsa Oilers, bettered by the marks of manager-first baseman Jack Lelivelt (.384) and second baseman Jim Washburn (.375). 18 The Sporting News, October 23, 1924. 19 See, e.g., Richmond Times-Dispatch, December 24, 1924. 20 As reported in the Richmond Times-Dispatch, January 1, 1925, Omaha World Herald, February 5, 1925, and The Sporting News, February 12, 1925. Jack Lelivelt, his managerial predecessor at Tulsa, had departed to take the reins of a Western League rival, the St. Joseph Saints. 21 As reported in the Aberdeen (South Dakota) Daily News, July 1, 1925. See also, the Omaha World Herald, July 7, 1925. 22 The Sporting News, July 9, 1925. 23 As reported in the Omaha World Herald, August 6, 1925. 24 (Portland) Oregonian, August 25, 1925. 25 As reported in the Omaha World Herald, January 1, 1926. 26 Baseball-Reference provides no 1926 offensive stats for Lamb. The info above was taken from The Sporting News, October 21, 1926. 27 As reported in the Dallas Morning News, November 7, 1928, and The Sporting News, November 15, 1928. 28 The Sporting News, November 15, 1928. 29 As reported in The Sporting News, February 12, 1931. 30 The Sporting News, February 5, 1931. 31 Ibid. No other details of the incident were found by the writer. 32 See e.g., the Joplin Globe, April 1, 1944, July 24, 1945, June 23, 1946, and September 11, 1947. 33 As per the Joplin Globe, June 22, 1944. 35 Obituary published in The Sporting News, October 19, 1955.